A fun and easy-to-use tool for creating your own BASIC programs. 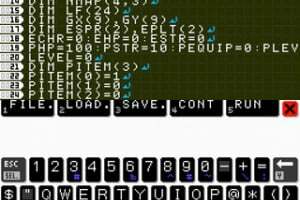 Petit Computer is an easy-to-use programming tool that lets you create everything from music, to images, to your very own original games using an adapted version of the classic BASIC programming language. 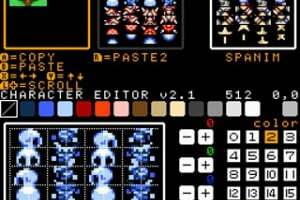 Whether you have experience of BASIC, or are a complete novice, you will find that Petit Computer will give you the skills you need to create your own programs. You can select commands and run programs using the Nintendo DS Touch Screen, and you can even share your creations via Nintendo Wi-Fi Connection, allowing you to collaborate with other users. You can also create special QR codes containing your programs that other users can scan using their Nintendo DS system camera. 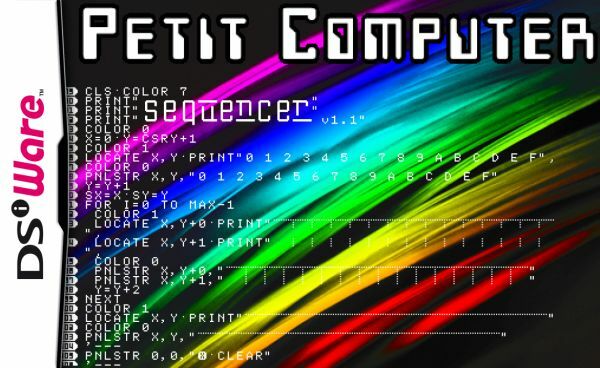 Petit Computer is a perfect companion for anyone who has ever wanted to delve deeper into the world of computer programming. I cannot wait for this ! 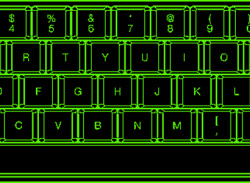 I can remember actually playing with Basic to make games .... this is going to be soooooo much fun to play with again! This DSiWare title sounds great! I will buy 4 copies, one for each Nintendo handheld I own so I can always dabble on the go... I am very psyched for this one. I was the only one in my class that passed Basic, everyone else failed it. I had though it would have been the other way around... boy was I surprised. I was looking for some more information, and found out there is a full suite of editors for PC/Mac in case you don't want to do your work on a virtual keyboard all the time. Cool! Can't imagine this application appealing to a large segment of the DSi/3DS gaming population, especially given the amount of effort required to create anything. But I think it's awesome. Day 1 buy for me. I dunno if I'll get this, because I have a short attention span and tend to only finish small projects. OMG, must get this! I've been wanting to learn BASIC, but I haven't had the time or a program that would allow me to work with it. This will give me both! There's more than a version of basic. Anyways, I'm having a lot of fun with this little app, I'd recommend it to anyone. ANYONE? Even those with zero programming experience? lol I really want to make sure this won't be a waste of money... it's up there at $8. Definitely fun to re-learn some of the commands I've forgotten after all these years. I found a couple of my old programs, but the POKE command don't work. I wrote a dumb little number guessing game and have scanned a few off the Japanese site (some very good examples of what PetitCom can do there). 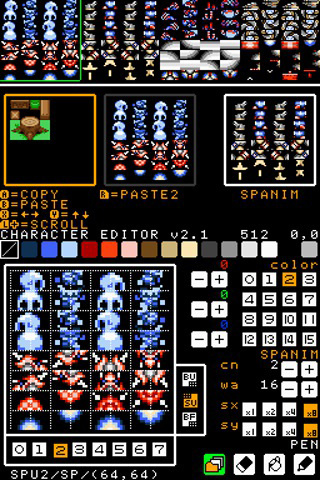 I used to play around with BASIC as a kid on my Acorn - back when I thought I could actually be a game designer. Love to take it up again....and then maybe one day...who knows? Why on earth is there not a DECENT TUTORIAL on Smileboom basic in english yet ????? 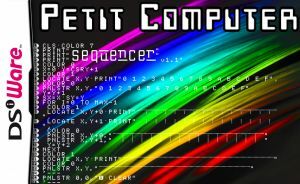 Here's my two cents: go to the Petit Computer website, print off several of the sample programs, and tinker with them. Grab a Basic tutorial like this http://home.cmit.net/rwolbeck/programmingtutorial/ and look for similiarities. read 8 chapters of C++ for dummies, have a commodore 64... I've always wanted to program my own RPG and this is as close as I've been. No there isn't a little birdie who walks u though a tutorial but the help guide is just that (helpful). u could do as I did and print all the info u aren't familiar with for quick reference. If u know the book, "Gardens of Imagination"... u should have no prob. with this!!!! ...Still not here? What are they doing? @Morphtroid and today, you are famous for creating petit farm! Programming? I love this app. I'm making a game with over 1000 lines of coding and I'm going to send it to all my friends. i made like 300 games for it! It's taken over a year for this to come out in the EU after it came out in NA. Shesh!! I don't even remember which friends of mine were using it, it's been that long since anyone has talked about it. !!! on the 25th! In 3 days! this is a godsend! There needs to be a Petit Computer for Python. I'd buy that in a second. Meh, I don't have a 3DS, but I still like the current! @SkywardLink98 me too. i am addicted to python coding. cant wait for the Australian release. 2015. Satisfaction = none. Come on! A new game for dsi ware came out a month ago. Aaaany way.